YouTube via MobileGeeks.deSamsung showcased these flexible displays in 2010. Samsung has been working on bendable screens for smartphones over the past few years, but the company is now promising that display technology will be ready to arrive in real products starting next year. 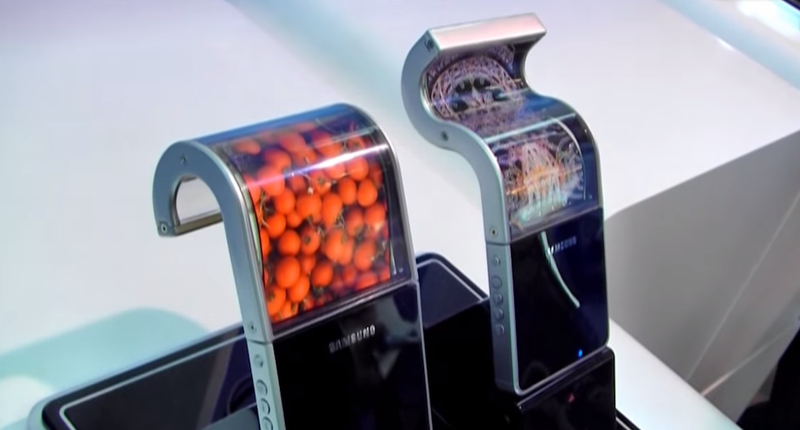 At Samsung’s Investor Forum in New York, the company revealed these displays will be so bendable that they can actually fold in half, according to ZDNet. There’s an important difference between flexible and bendable. Phones such as Samsung’s Galaxy Note Edge, Galaxy Round, and LG G Flex have screens that are slightly curved, which supposedly offers a few benefits such as the ability to see notifications when the screen is turned off and a more ergonomic design that fits into your pocket more easily. Based on the way Samsung is describing its newer technology, however, it sounds like you’ll be able to actually fold and bend future phones. Of course, developing a bendable screen is only half the battle — manufacturers still need to find a way to make processors, batteries, and all the other components inside smartphones flexible too. LG and Samsung have both already started working on batteries that can bend and fold. So why would you want a bendable smartphone? It’s unclear if this will actually prove to be useful or just gimmicky, but in theory the ability to fold it could make it more compact and durable.